With the summer quickly approaching, most Los Angeles dog trainers are encouraging their clients to make sure they keep their dogs safe from the heat. With the onset of the heat, there’s another danger that a lot of trainers don’t consider… dogs and pools. Dogs and Pools are pretty popular in Los Angeles. If you have both, there are some things to consider… Pool safety for dogs is pretty much the same as pool safety for children. It’s one of those things that requires more than just careful supervision. You can’t ever assume that you’ll always be able to watch them. It only takes a couple of minutes of distraction for things to go terribly wrong. It’s imperative that you teach your dog (first) how to swim, and (second) how to find the stairs to your pool. Most pools have a little ledge or lip that would make it nearly impossible for a dog to get out if they fall in. Even if your pool does not have a lip, because of the way dogs are built it will be difficult for them to pull themselves out of the pool. That’s why teaching them to find the stairs is crucial. Aside from safety, teaching your dog to swim has tremendous benefits for you and your pup. It’s a great aerobic exercise. You can burn off your dog’s extra energy, it can be useful for dogs recovering from surgeries, and helps senior dogs burn calories without putting a lot of pressure on their joints. Some dogs are natural born swimmers, but most are not. When you’re introducing your dog to deep water, first and foremost you want to get a life vest… preferably one with a handle. Second, you want to put your dog in the vest and hook a leash up to their flat collar or martingale collar. Third, lure them down the stairs into the pool with some treats. It will help if you get in the pool and coax them in. At this juncture, let me say, regardless of whether your dog likes water or not and “he never goes in the pool, even when we’re in it…” you need to do this. An accident can happen in a second, it’s better if your dog has the experience and training that can save their life. If you’re not comfortable doing this by yourself, find a reputable Los Angeles dog trainer to help you. Imposing this on a dog might be controversial, but it’s a non starter for me. All my dogs have to know how to swim even if they don’t particularly like the water. Once the dog is in the water, you want to use the handle of the harness to guide them a few steps away from the stairs then around in a u-turn back to the steps. 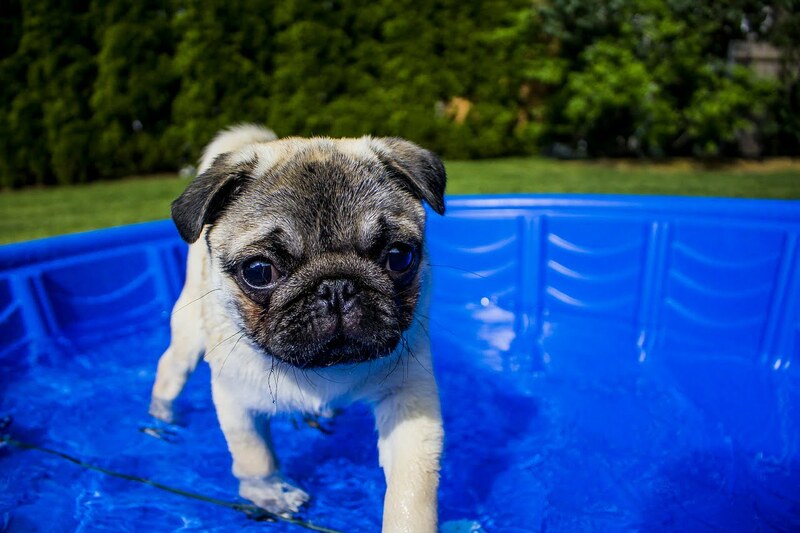 The thing about dogs and pools is… most dogs will splash wildly initially then begin to paddle. Once they get to the stairs, let them walk themselves up and out of the pool. After they shake off, give them a minute or so and repeat. I’d recommend only do this 2 or 3 times in any given training session. As your training progresses, you want to start walking your dog out further and further having them u-turn left and right. Guide them with the harness handle. As they get more comfortable, you can let them paddle around longer. You can also give them more space and guide them with the leash attached to their collar. When your dog is comfortable in the water and paddling on his own, you can remove the vest and just keep the leash on the collar. Lure the dog around the pool gently with just the leash and collar. The second part of dogs and pools safety for me is teaching the dog to find the stairs. All this time you’ve been luring your dog around the pool with the leash, they are getting a pretty good feel for the the pool and should be pretty good swimmers. For this second step, I like to put the vest back on. As you stand at the edge of the pool, use the vest to dip your dog into the pool close to the wall. Use your leash (on the collar) to lure the dog along the wall until they reach the steps and get themselves out. Start putting them in at different points on the walls of the pool. Lure them along the wall back to the stairs using both the longest and shortest routes. As they come up and out of the pool, reward them with a high value treat. You should put this behavior of getting out of the pool on cue. The reason I like to put it on cue is to proof that the dog knows how to do it. Practice telling the dog COME OUT while you’re both in the pool and out of the pool. When you see the dog understands how to get to the stairs, you know they get it. Couple of things to consider, you definitely want to stop any training sessions before your dog gets physically or mentally tired. Secondly, even once your dog is good at swimming, you should never let them swim in the pool without you watching them. Teaching your dog to swim and get out of the pool are somewhat complex behaviors to teach. You should certainly contact a reputable Los Angeles dog trainer to help. If you’re interested in us helping you with this or any other training issue, please fill out our questionnaire to set up an evaluation.